Hello! Jennifer here to remind you to Cherish your family and friends...you never know how long you will get with them! Last night my Aunt lost her battle with Cancer. From the time she knew until the time she passed was only a matter of weeks. Tomorrow we will be on our way to meet up with the rest of the family. It's an almost 13 hour drive but I am eager to give my family members a hug when I see them! 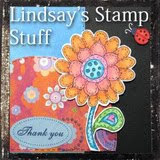 I did this card with craft markers, vellum stickers, flowers, brad, cardstock/papers, and the chalk is on the textured looking paper under the digi stamp and flowers. I mixed powdered chalk, alcohol inks, glitter, and water and let dry. On top in two corners I used two sided tape and sprinkled powdered chalk over top and brushed away with a brush (to cover the adhesive strip with the chalk). The Powdered Chalk I used was from Stamp N Plus Scrap N.
So sorry to hear about your aunt. Hugs and prayers for you! So sorry for your loss Jennifer. It was a blessing that she did not have to live with the fear of the Cancer for too long. My Aunt went that way too and I thought it was a very merciful way to go.